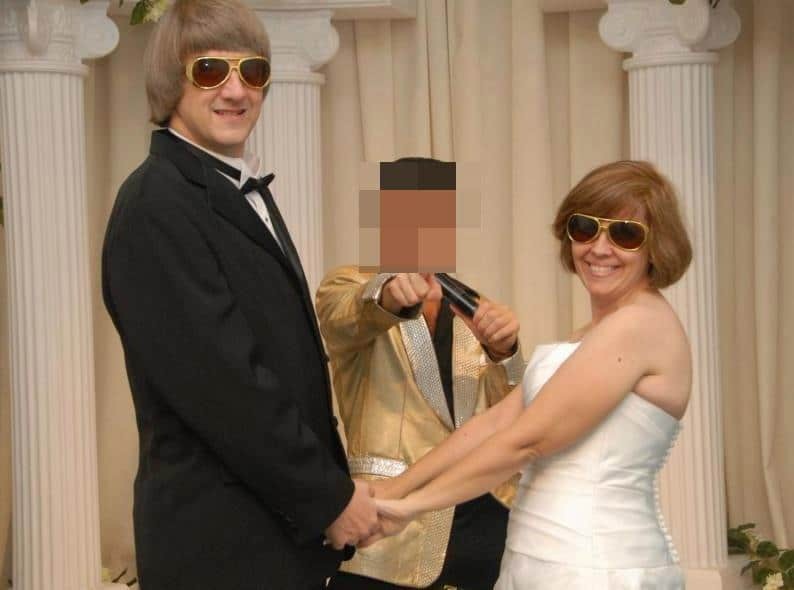 Michael and Louise Turpin secret horrors: How did no one know? Home Scandal and Gossip Murrieta, California house of horrors: How did no one know? Pictured, Michael and Louise Turpin of Murrieta, California. 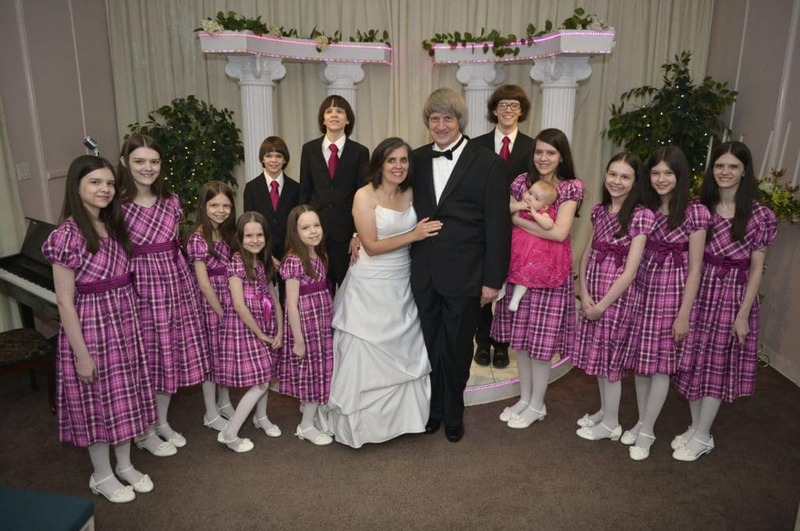 Michael and Louise Turpin, Murrieta, California house of horrors: How did one family manage to escape un-noticed as they kept their thirteen children imprisoned and living in heinous circumstances? In the aftermath of Sunday’s arrest of Michael and Louise Turpin, the ‘deeply religious’ couple who shackled and padlocked their prisoner children at their Perris, Southern California home, until one of the children managed to escape and notify authorities, questions have since been asked how was it that nobody ever knew of what went on in the household? When Riverside County Sheriff’s Department deputies arrived at the family’s nondescript Murrieta one story four bedroom home (which looked pretty much like all the other homes in the town of 75K) authorities were shocked as to what they would find. Prodding inside following a frantic 6am Sunday morning phone call from the Turpin’s 17 year old daughter, police told of finding a number of the Turpin’s thirteen children shackled with chains and padlocks to beds and furniture. Police noted conditions inside the house were filthy, along with the rescued siblings. A police report described the children which ranged from ages two to twenty-nine ‘appearing malnourished and very dirty,’ and as a result of their emaciated features, appearing far younger than their actual years. In the course of investigations, Capt. Greg Fellows of the Riverside County sheriff’s department told of having no previous contact with the either Michael or Louise Turpin. Child protective services hadn’t been called to the home in the past either Fellows told during press statements. But how? How could police or any other authority figure or body not have known about the horrors that the Turpins had subjected their children to? California ‘horror house’ mom treated pet dogs better than kids. 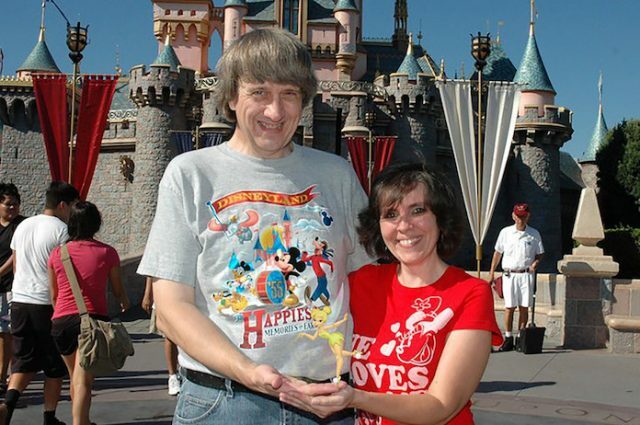 Pictured, Michael and Louise Turpin brood of thirteen children- as they appeared on Facebook during a trek to Disneyland. 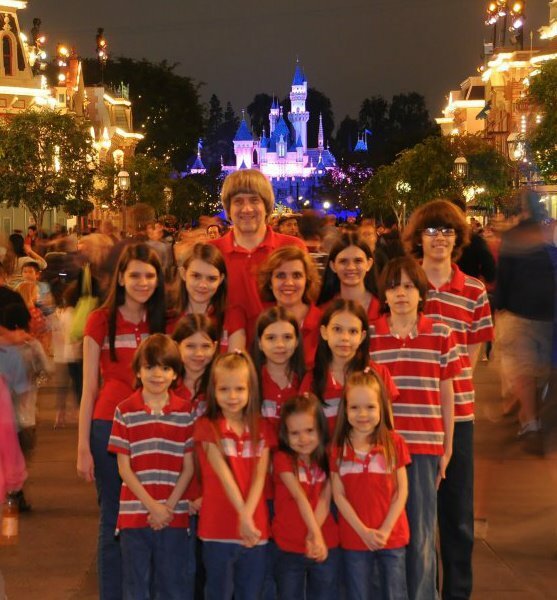 A regard of the family’s social media profile showed a ‘happy go lucky’ family enjoying the spectacle of Las Vegas and Disneyland where the Turpin’s had gone to celebrate their version of the American dream, having gotten married no less than three times to each other since 2010 while taking what appeared almost annual trips to ‘Mickey Mouse surreal land’. Each image showed a translucent family, showing off to the world, friends and family that all was well, even if in some of the images some of the children appeared ill and emaciated. But they were all smiling, laughing, sporting the same haircut, his and hers t-shirt- what could possibly be wrong one could wonder looking at the photos? Equally odd, for a grandmother of thirteen, the Turpin’s had either forbidden or dissuaded Betty Turpin making the track from Mercer County, Virginia to visit her grandchildren- something that must have too ‘conveniently’ suited David and Louise Turpin as they grappled with their economic woes, and their notion that they ‘were doing God’s work’. Further shrouding the house of horrors that took place indoors and sometimes in the front yard to the ‘bemusement’ of neighbors (more on that below) was the fact that David and Louise Turpin had set up their home to be a private school, the Sandcastle Day School, where David Turpin reined as school principal. A private school where state officials had no jurisdiction, no prying eyes and no way of ever knowing what was actually being taught (almost if not exclusively bible studies). Never mind the emotional and intellectual state of the children’s minds as they made their way from one filthy room to another, malnourished, emaciated and perhaps resigned to their surreal absurd existence, day after day. 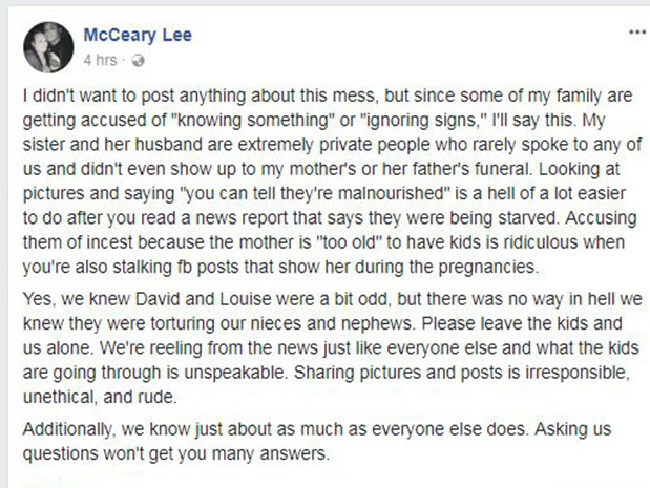 David and Louise Turpin relative, McCeary Lee Facebook post. Showing to the extent the Turpins kept their ‘secret’, Louise Turpin’s younger sister McCeary Lee, who lives on the Pacific island of Guam, described the couple as ‘extremely private people who rarely spoke to any of us’. ‘We knew David and Louise were a bit odd, but there was no way in hell we knew they were torturing our nieces and nephews,’ Ms Lee posted on Facebook. Of disconcert, Louise Turpin’s parents had tried to visit their daughter and son-in-law in the recent past, only to have to turn back at the airport when the Turpins refused to provide their street address. Which raises the awkward question, where were the neighbors and didn’t they notice anything? 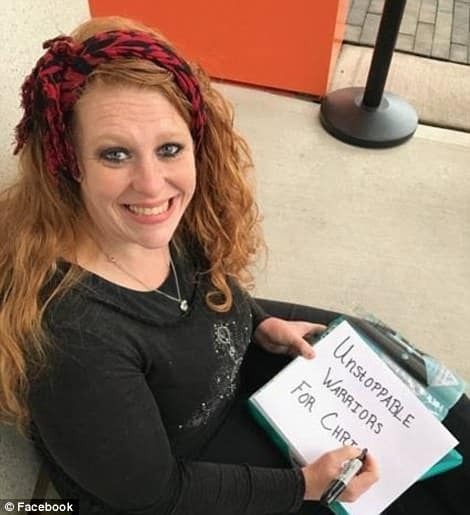 Also banished from the Turpin household was Louise Turpin’s sister, Elizabeth Jane Flores who told of the Turpins forbidding anyone to visit and declining to give out a know address. Michael and Louise Turpin: Kitsch and fun loving on the outside, but twisted and perverse on the inside? Renewing their wedding vows in Las Vegas (for a third time since 2010). Michael and Louise Turpin neighbors suddenly remember the tell tale signs….. Neighbors interviewed told of rarely seeing the Turpin children, whom refused to speak when approached. Neighbors in afterthought agreed the children appeared pale and somewhat emaciated, with one neighbor having noticed the children scrummaging through rubbish bins looking for food but having thought nothing much of it. Which is to wonder what exactly does sinister actually look like? Or can sinister exist within the veneers of seemingly ‘polite’ picture perfect (but slightly emaciated) society? Neighbors told of the Turpin house being devoid of toys or bicycles, with most saying they didn’t see much of the family who purchased it in 2014. Another neighbor, Mike Clifford, 60 who lived across the road told via the nypost of having seen the Turpins marching the children back and forth. Mike went on to say of often seeing the Turpin siblings being marched through the upstairs rooms between midnight and 3 a.m. But that too failed to arouse enough suspicion or concern or at the very least an anonymous call to Child Protection Services. Perhaps the only clue that things might have been off came when the Turpin’s lawn had been cut after a visit from local officials to enforce an ordinance for an unkempt yard. Little did officials know the degree of discord that lay beyond the overgrown front lawn and unkempt hedges and lassoing weed. Upon their arrest Sunday morning, David and Louise Turpin remain in custody on suspicion of torture and child endangerment. Bail was set at $9 million each. 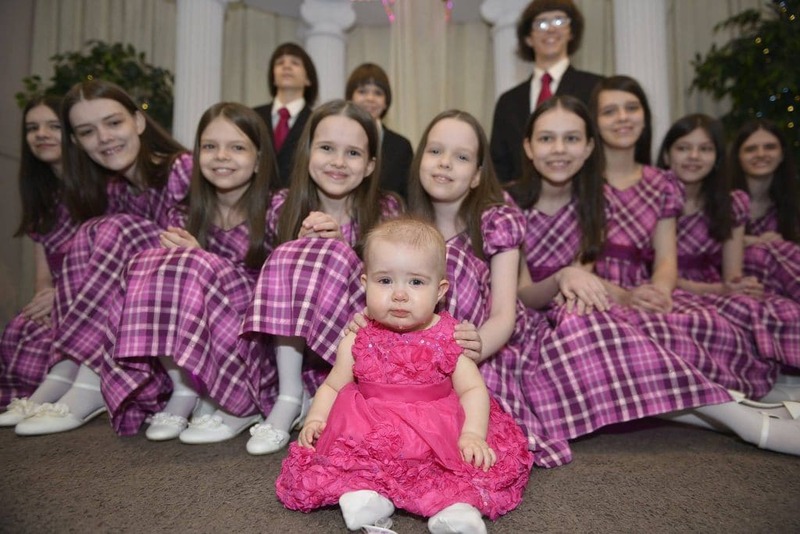 Michael and Louise Turpin bring their 13 children with them to Las Vegas as they exchange wedding vows (once again). Michael and Louise Turpin California house of horror secret.